The market for sustainable investments generally and in the real estate sector in particular has grown significantly. Many investors nowadays are keen to invest in assets that meet ESG (environmental, social and corporate governance) criteria. This trend is increasingly in keeping with the times, and is above all popular with a new generation of investors. Sustainable properties are particularly suitable for this approach as they can be judged against ESG criteria in numerous respects. Indeed, the demand for sustainable properties is increasingly shaping the market itself, influencing the industry across the entire value creation chain. In addition, the rise in regulatory requirements, particularly in connection with environmental criteria and sustainability in construction and renovation, is increasingly making compliance with sustainability standards a prerequisite. The appeal of sustainable properties is not just reflected in their future viability, but also in their ability to deliver investment performance. Global Real Estate is convinced that sustainable properties have precisely what it takes to deliver an attractive financial and environmental return. After all, buildings are responsible for 40% of global energy consumption and account for around 50% of global consumption of resources. For these reasons, the real estate sector offers a huge opportunity to improve mankind's ecological footprint. The best sustainable investments combine strong financial performance with adherence to the most rigorous sustainability standards. This much is apparent from the development of the MSCI Global Green Building Index. This index encompasses small and large companies from developed and emerging markets that generate at least 50% of their sales through products and services that come from "green" buildings. 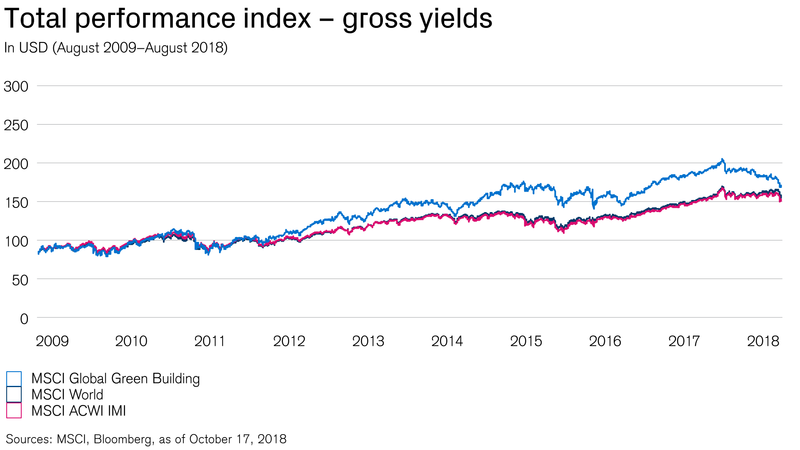 Over the last 10 years, the MSCI Global Green Building Index has significantly outperformed its benchmark index, the MSCI World, in USD terms. Indeed, it has also outperformed a number of pure real estate benchmarks. That sustainability can also pay financially is also confirmed by a number of studies that highlight a significant positive correlation between ESG/sustainability factors on the one hand and key financial ratios (e.g. return on equity (RoE) or return on investment (RoI)) on the other. In other words, investors can pursue their environmental convictions while at the same time generating attractive returns. In order to make a contribution in this area, Global Real Estate pursues a comprehensive sustainability approach. On the one hand, particular care is taken to ensure the use of environmental construction methods in new builds and renovations, while on the other, existing portfolio properties are monitored on an ongoing basis and reviewed for optimization potential. This is done in partnership with Siemens Schweiz, the longstanding partner of Global Real Estate in the area of intelligent building optimization. Where potential is identified to improve energy efficiency and reduce CO2 emissions, Global Real Estate defines the corresponding measures with Siemens and implements them accordingly. Since the launch of the energy-related building and portfolio optimization program in 2012, more than 2,600 efficiency measures have been implemented in more than 1,000 buildings, leading to an overall CO2 reduction of almost 10%. Many real estate investment managers are confronted with the challenge of finding suitable sustainable properties. How can sustainable properties be distinguished from their more conventional counterparts? The last few years have seen the emergence of various building labels and certificates that help investors to identify the market for sustainable properties. As there are a number of fairly significant differences between the various regional and country-specific labels – such as Minergie, LEED, BREEAM, Energy Star, DGNB etc. – making comparisons between these individual certifications is unfortunately only possible to a limited degree. Global Real Estate has launched its own seal of quality – "greenproperty" – with the aim of offering the most transparent and all-encompassing ESG sustainability criteria possible when it comes to property evaluation. The greenproperty seal was conceived specifically for new builds and project developments in which comprehensive sustainability criteria can be evaluated and measured in a systematic way. These data make it possible to improve the sustainability performance of both individual buildings and real estate portfolios on an ongoing basis. Just a few years ago, Global Real Estate launched the first sustainable Swiss real estate fund, CS REF Green Property, which only invests in properties that meet the requirements of the greenproperty seal of quality. The Credit Suisse Real Estate Fund Green Property is the real estate fund that focuses on sustainable construction. In order to systematically measure its own sustainability performance and facilitate a comparison with national and international competitors, Global Real Estate – as one of the world's largest real estate investment managers – takes part in an annual ESG benchmarking process known as the Global Real Estate Sustainability Benchmark (GRESB). This leading global and independent sustainability benchmarking initiative evaluates and classifies more than 900 of the world's largest real estate investment managers spread across 64 countries. An increasing number of investors use GRESB – or ask specific questions about a real estate investment manager's GRESB status – before making their investment decisions in the area of sustainable real estate. Thanks to an in-depth, systematic review of sustainability performance, Global Real Estate manages to provide the greatest possible transparency regarding ESG performance and improve its own performance on an ongoing basis. Is active Economic and environmental returns. At the same time.